With so many restrictions and security compromises, Internet Theft, Scams, and Malware, it is not easy to browse safely nowadays. That’s’ why, using a VPN and choosing the right client is an important task. Fortunately, there’s always a location. With an amazingly encrypted network and reliable connection speed, Le VPN is the only network service that could think about. Instant setup, non-restricted access and protected servers, and much more. It offers remarkable services, both free and premium. For those who don’t know much about VPN service, a VPN client works by altering the network route and accessing the website by a private network of servers distributed across various locations globally. So without any further talking, Let’s start the review of Le VPN. To start using the services of or any other server, you’ll need to setup the VPN client on your device or the browser. 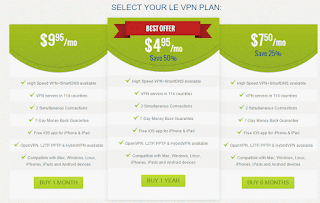 Since Le VPN is a premium VPN service, it offers multi-platform support to install VPN. Windows, Mac, Android, iPhone or Linux, Le, is aimed to provide restriction free internet access to every device possible. 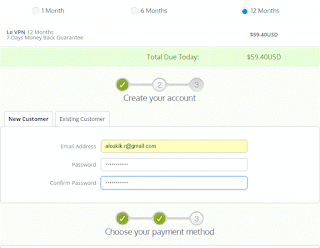 Choose the respective plan, enter your email address, new password, and the payment method, and it’s done. Le VPN has improved its signing-up process by removing the personal information section. Once the sign-up process is completed, Le VPN then sends you an email with all the transaction details, user details and the setup guide on how to download the VPN client for your device. If you’re not satisfied with the services and all the features, the company offers a 7-day Trial with money back guarantee. After few clicks and ticks, the client is ready to rock. The home screen welcomes you a list of distributed folders that consist different locations and country profiles for the access. Right Click on the folder to start the connection with the profile and the VPN client starts respectively. It has a simple yet confusing interface which takes a little time to get the hold of all the features and options. Moreover, after the connection begins, the client works efficiently and you can start browsing all the restricted web sites anonymously and seamlessly. The best feature that I liked about in the Le VPN is the HybridVPN system that offers multiple browsing over different locations, all the same time and by the same network. You can access two separate streaming websites simultaneously. The DNS works fast, the response time and the IP address performed great when tested and compared with other VPNs. The client provides unlimited bandwidth, three security protocols, OpenVPN, L2TP/IPSec and PPTP like extended features with its premium plans. Easily mask your connection and bypass geolocation restricted websites. Le VPN has a broad range of server locations spreading across 114 countries, covering all the five continents. You can browse almost any geo-restricted website like Netflix, YouTube or Spotify anonymously and without any compromise with the security. With over 7400 servers, Le VPN offers worldwide services along with fast and secure access to almost every blocked or restricted website. For more details regarding the extensive uses of a VPN click here. Note: – Le VPN is amongst the few VPN providers who are still able to unblock Netflix in the US, France and other countries, with their VPN service as well as with their HybridVPN and SmartDNS. Well, the premium network client offers three standard plans depending on the duration of usage. All the plans are priced on a monthly basis and are further reduced for an extended period. The monthly plans start for $9.95/month and the half-yearly plan is priced for $7.50/month. I personally recommend the Annual plan as the subscription is only for $4.95/month. Being a leading VPN service provider, the company offers a wide number of payment methods for the ease of customers globally. You can pay by Visa, MasterCard, American Express or by online payment methods like PayPal or even Bitcoins. The company has 24*7 support and data protection for all the users. Le VPN is offering a chance to everyone to become an affiliate and earn from referring Le VPN to other people, friends or family. They are giving 40% commission straight if someone buys from your referral or just renews his plan. So, it is an incredible opportunity for anyone who is looking to make a decent amount of money by just promotion and shout-outs. 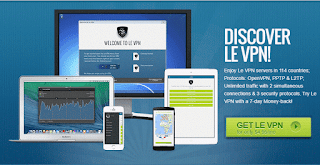 For more in-depth details you can read the full review of Le VPN by Anonymster. All in All, Le VPN is clearly a remarkable VPN service provider focused on deploying encrypted network globally and access to restricted websites on the basis on geolocation. With robust support, HybridVPN system, and multiple protocols, Le VPN is definitely one of my first choices for a protected network and a fast VPN client. Of course, the service offered are premium but with so many features, Le VPN is a worthy deal to watch out. The basic plan starts from $9.95 for a month’s subscription. So, this was my take on the Le VPN and all the services offered by it. Do share your thoughts about this VPN client in the comment section below. Also, if you’re already using it, then please share your experiences with us. Cheers!